Amelia has appeared on stage with the Hyde Park Community Players many times! She has been in all of the outdoor summer Shakespeare productions – The Tempest, Twelfth Night, and As You Like It. She has been in Musical of Musicals, The Musical!, The 25th Annual Putnam County Spelling Bee, An Ideal Husband, Clybourne Park, and The Marriage of Bette and Boo. 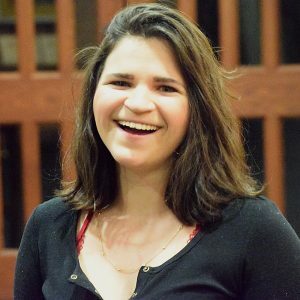 She is a regular performer in the Friday Staged Reading series and also directed Spring Awakening for the series. 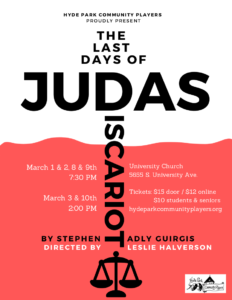 What made you want to audition for The Last Days of Judas Iscariot? Being directed by one of my favorite people in the whole world! It’s very different from other shows HPCP has done, very modern, and I am excited to be involved. You are playing dual roles in this show. Have you connected with either more than the other? Mary Magdalene is easy to connect to. She’s a proto-feminist, she subverts the audience’s expectations of her as a prostitute. Gloria, she talks about her children and her grandchildren. Leslie and I talked about it, and in our show she appears as a younger woman because in heaven you get to choose your representation, and her younger years, that was a happier time. It’s hard to ‘introduce’ you. I don’t know what to ask. What else can I tell everyone about you? Can we talk about what you do when you’re not acting? Sure, I am a soprano in the Rockefeller Chapel Choir. I work at the MSI as a Team Coordinator. And I do Trivia on Tuesdays. Oh, I should add that you did the graphic design for the promotional poster for the show. It’s lovely and striking. Thank you!